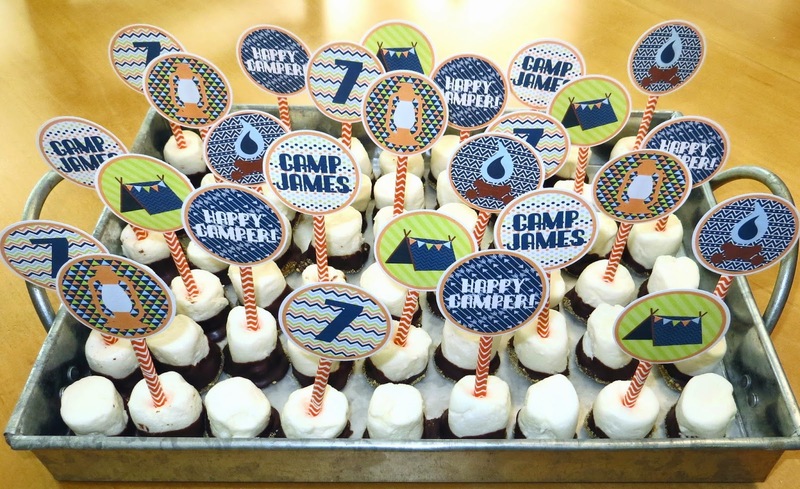 We had a camping themed sleepover birthday party for my son's 7th birthday! We ended up inviting a ton of kids but they had a blast and we survived! It will go down in history as the most epic sleepover ever - at least in my son's eyes! 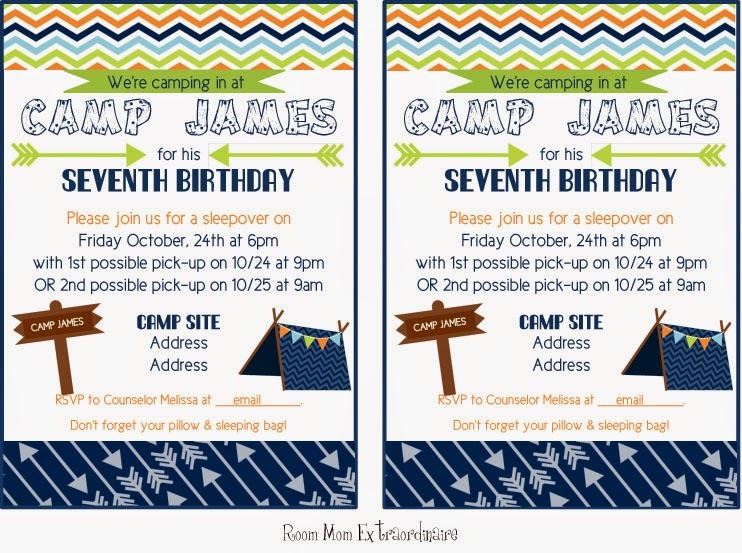 I got these ADORABLE paper backgrounds and camping clip art files from Jessica Sawyer Design on Etsy (purchase HERE). 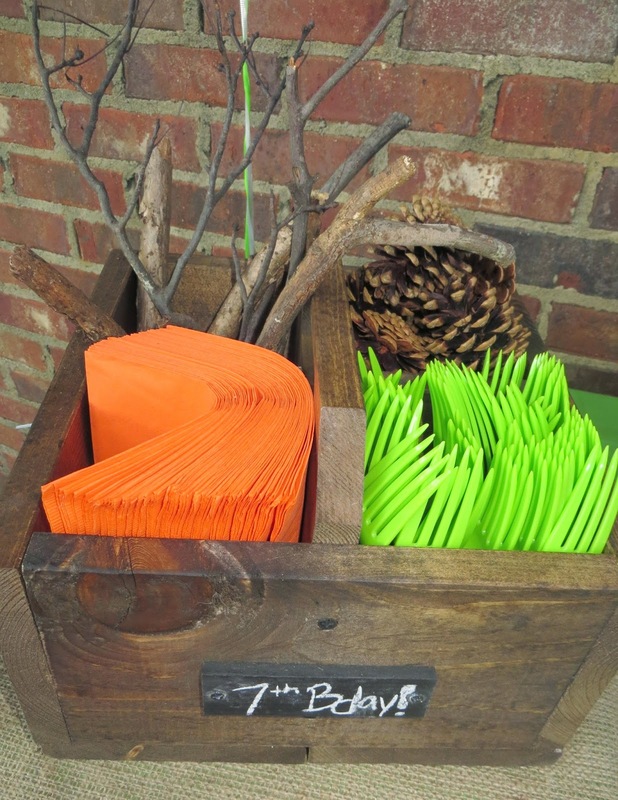 I used her files to create my invitation and all of these cute camping themed items! I also used mostly "Hallandale Deco JL" font plus "Cicle Gordita" font and "DriftType" font. Here is the invitation. We did not sleep outside and I gave 2 pick-up options because I didn't know some of the parents very well and didn't want the child not to come even if they couldn't spend the night! When the kids arrived, I gave them an orange bandana to wear and let them play outside for a little while. (The picture is really cute of all of them in their orange bandanas!) Next, we ate dinner, which I had set up outside. 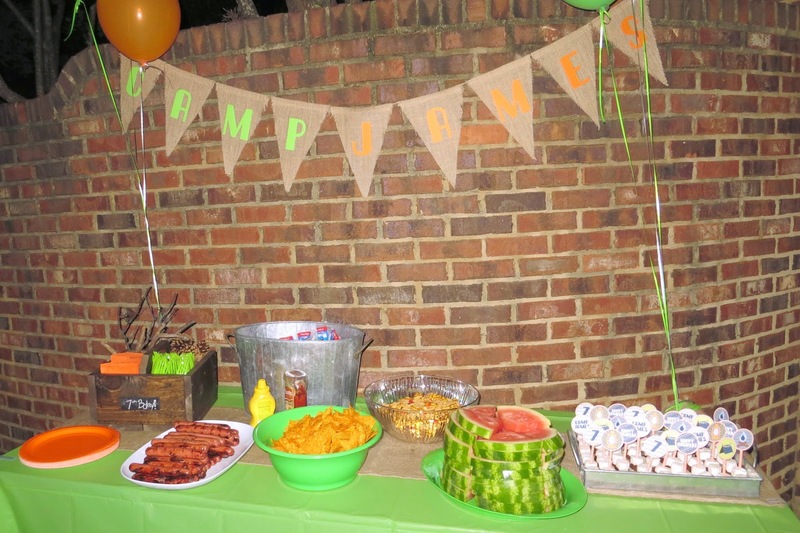 To decorate, I made a "Camp James" banner and used orange and lime green colors. 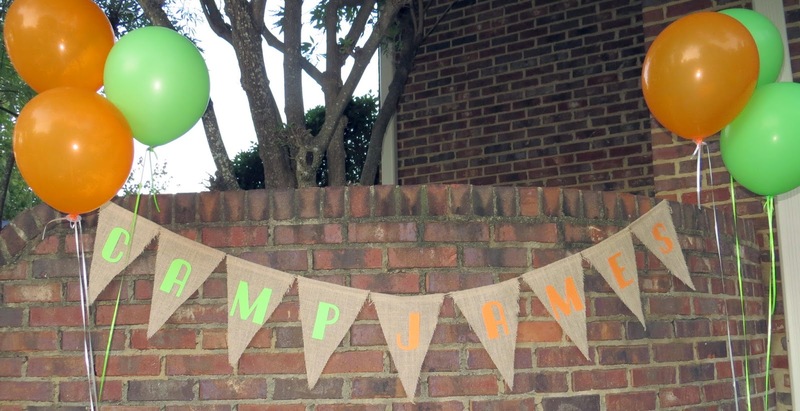 For the banner, I used burlap triangles that I found at Hobby Lobby and added letters cut by my Silhouette ("Hallandale Deco JL" font). I served hot dogs, chips, trail mix, watermelon, and chocolate dipped marshmallows. To make the chocolate dipped marshmallows: melt chocolate, dip in large marshmallows about half way, then drop in graham cracker crumbs to coat the bottom, and let dry. I added tags to the marshmallows (download HERE), which I taped to halved orange chevron straws. 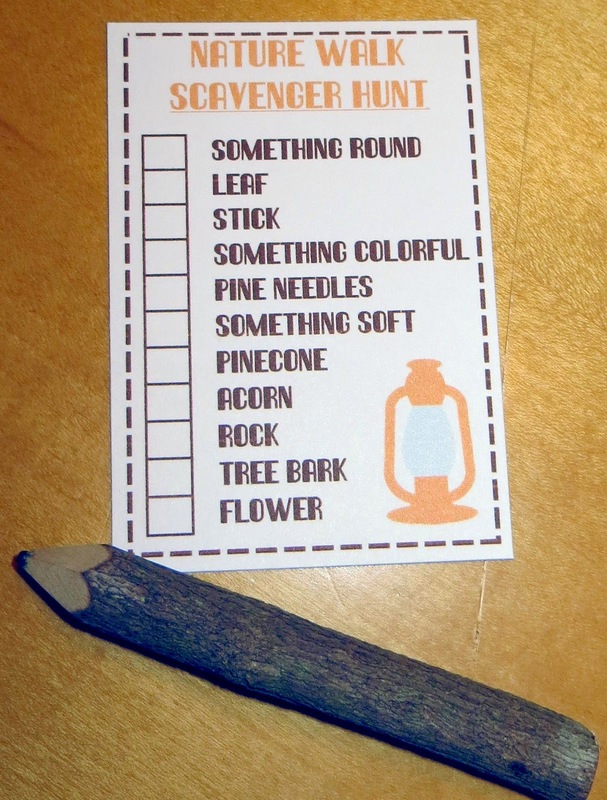 And, we had a Nature Walk scavenger hunt (download HERE). Next, we ate cake and the kids came inside to settle down and watch a movie. In the morning, we gave out brown favor bags that I had stamped and put their names on. 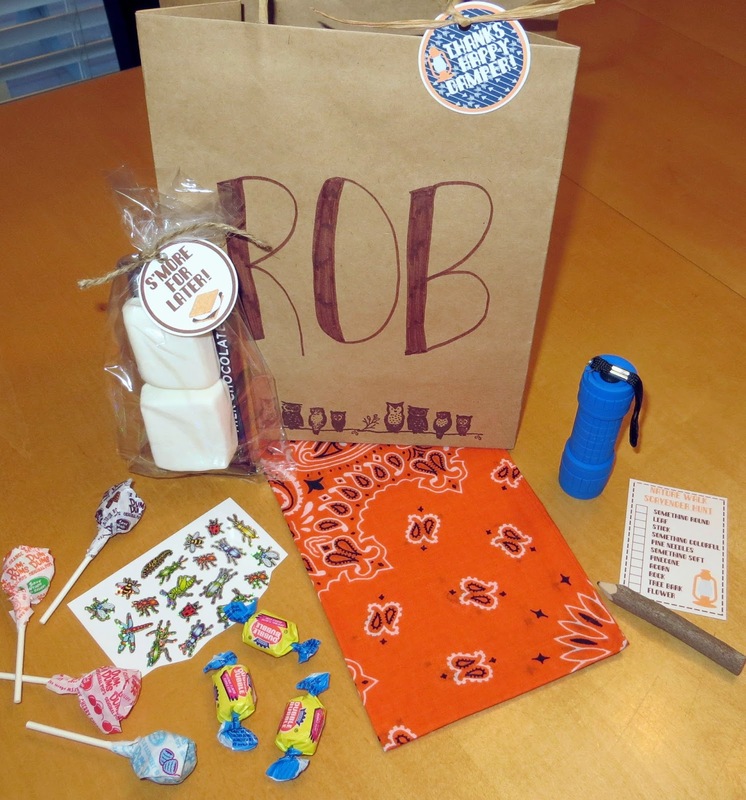 The favor bag had a flashlight, their orange bandana, the scavenger hunt items including a wooden pencil, any leftover bug stickers, candy, and a s'more kit. 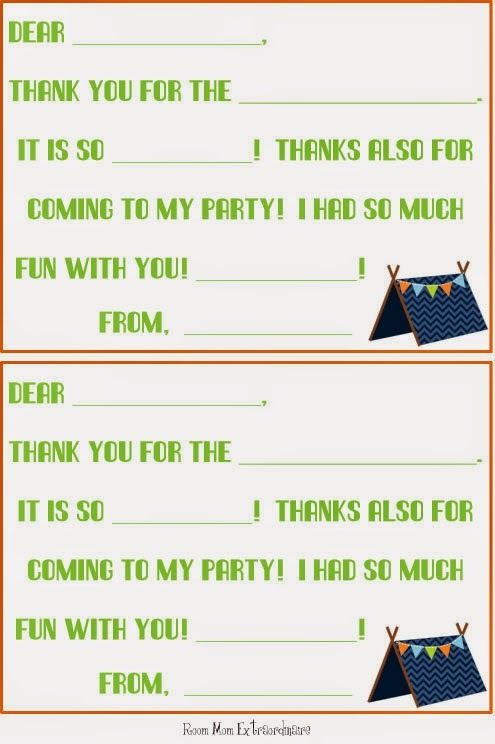 I attached a "Thanks Happy Camper" tag (download HERE). I individually packaged the s'more kit with 2 whole graham crackers, 1 Hershey bar, and 2 very large s'more marshmallows. 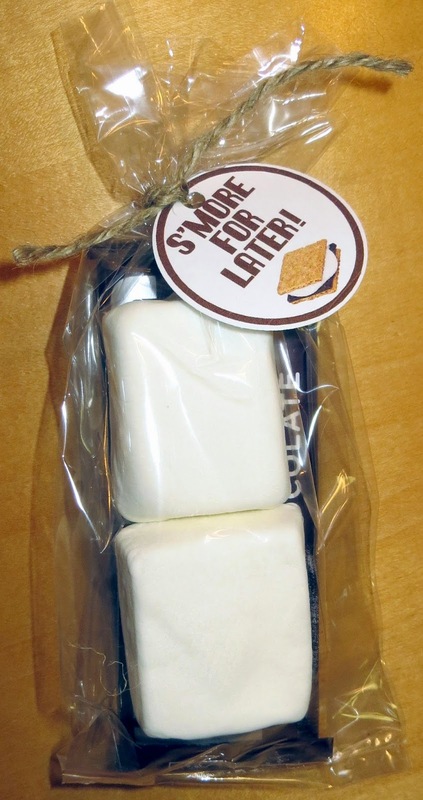 I attached a "S'more for Later" tag (download HERE). 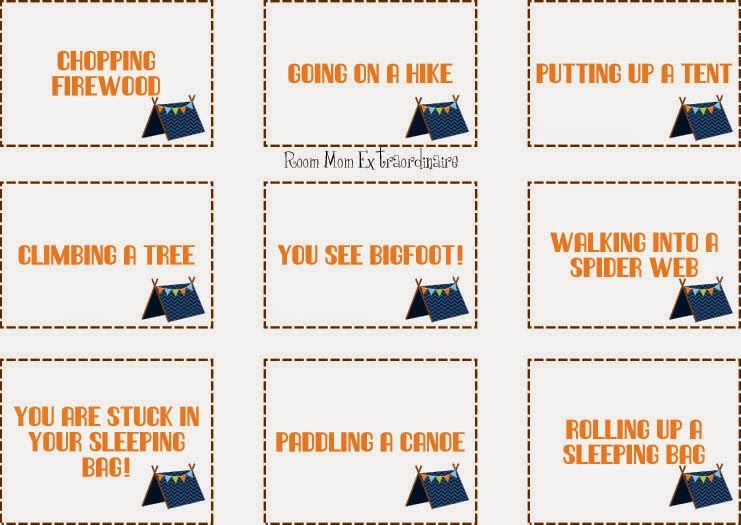 Here are some camping thank you notes too (download HERE)! This is a picture of page 1, but there are a couple of different wording options on the 2 page download. It was a super fun party!